5) Duquesne Incline: Built in 1877, the Duquesne Incline ascends and descends the treacherous Mt. Washington, near the junction of the Three Rivers. It is more than just a historic attraction. It is part of Pittsburgh’s public transportation system. To this day, it is owned and operated by the Port Authority of Allegheny County. 4) Kennywood: Unlike Six Flags and Busch Gardens, Kennywood is in a class all by itself. Kennywood is America’s Finest Traditional Amusement Park, and the best destination near Pittsburgh for family-friendly fun! Enjoy a unique mix of classic rides and modern thrills, including six roller coasters, a 14-ride Kiddieland, and several attractions that cannot be found anywhere else. Celebrating over 120 years of innovation and connection to the community, Kennywood continues to be an icon for each generation as one of the best amusement parks in PA. This coming season, Kennywood will be opening its newest themed land, Steelers Country, featuring the all-new roller coaster, Steel Curtain. Steel Curtain will feature a record-shattering nine inversions. Fun fact: Kennywood is one of two amusement parks registered as a National Historic Landmark. 3) Colony Café: Opened in February 2017, Colony Café has become a household name in the Strip District of downtown Pittsburgh. It is a wine and coffee bistro-type of café on the main floor, with a rescue cat loft upstairs. Freshly made sandwiches and wraps are favorites on its menu. Visitors must make their reservation for the Cat Loft at ColonyCafePGH.com. 2) Senator John Heinz History Center: Of all the museums in Pittsburgh, the Senator John Heinz History Center is an attraction not to be missed. The Senator John Heinz History Center is home to over four floors of Pittsburgh’s storied history. From the Heinz ketchup company, to Pittsburgh’s tradition of steel making, its iconic professional sports teams, and Mister Rogers’ Neighborhood, it is an attraction for all visitors to enjoy, and at best-appreciate. 1) Bicycle Heaven Museum: First established in 2011 by Craig and Mindy Morrow, Bicycle Heaven is the world’s largest bicycle museum & shop. Bicycle Heaven is home to the world’s largest collection of bicycles from vintage to present day. Bicycle Heaven is home to more than four thousand bicycles. Bicycles in Bicycle Heaven’s collection include the famous multi-seated bicycle from “The Monkees” TV show in the 1960s, Pee-Wee Herman’s bike, and the famous Spacelander. On two floors, visitors will be blown away by a world of bicycles and wall-to-wall rare artifacts. Visitors can read more at BicycleHeaven.org. Donations of any amount are graciously accepted. They keep the lights on, and the wheels turning. Pittsburgh is not just called the Steel City. It is America’s kind of city. It is the city where tradition, history, innovation, and family excitement flow together as one. 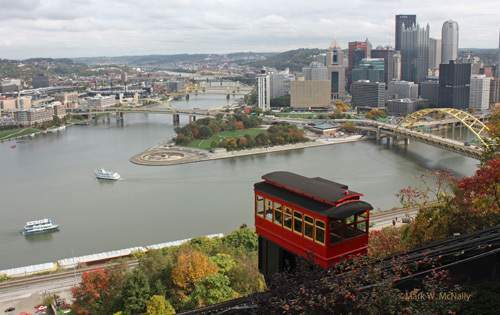 No visit to Pittsburgh is never complete without a ride on the famous Duquesne Incline. No appetite for fun and excitement is ever satisfied without a visit to Kennywood. Cat and coffee lovers are sure not to miss out on Colony Café. At the Senator John Heinz History Center, Pittsburgh history comes alive. At Bicycle Heaven, the days of riding a bicycle in your childhood come right back. If anyone’s looking for the perfect weekend getaway, Pittsburgh is the perfect destination. Note: All visitors must NOT forget their Terrible Towel!